While most of the discussion in the preceding chapters is concerned only with the behavior of code as executed a single statement or expression at a time, that is, by a single thread, each Java virtual machine can support many threads of execution at once. These threads independently execute code that operates on values and objects residing in a shared main memory. Threads may be supported by having many hardware processors, by time-slicing a single hardware processor, or by time-slicing many hardware processors. The Java programming language supports the coding of programs that, though concurrent, still exhibit deterministic behavior, by providing mechanisms for synchronizing the concurrent activity of threads. To synchronize threads, the Java programming language uses monitors, which are a high-level mechanism for allowing only one thread at a time to execute a region of code protected by the monitor. The behavior of monitors is explained in terms of locks; there is a lock associated with each object. The synchronized statement (§14.18) performs two special actions relevant only to multithreaded operation: (1) after computing a reference to an object but before executing its body, it locks a lock associated with the object, and (2) after execution of the body has completed, either normally or abruptly, it unlocks that same lock. As a convenience, a method may be declared synchronized; such a method behaves as if its body were contained in a synchronized statement. The methods wait, notify, and notifyAll of class Object support an efficient transfer of control from one thread to another. Rather than simply "spinning" (repeatedly locking and unlocking an object to see whether some internal state has changed), which consumes computational effort, a thread can suspend itself using wait until such time as another thread awakens it using notify. This is especially appropriate in situations where threads have a producer-consumer relationship (actively cooperating on a common goal) rather than a mutual exclusion relationship (trying to avoid conflicts while sharing a common resource). As a thread executes code, it carries out a sequence of actions. A thread may use the value of a variable or assign it a new value. (Other actions include arithmetic operations, conditional tests, and method invocations, but these do not involve variables directly.) If two or more concurrent threads act on a shared variable, there is a possibility that the actions on the variable will produce timing-dependent results. This dependence on timing is inherent in concurrent programming, producing one of the few places in the language where the result of executing a program is not determined solely by this specification. Each thread has a working memory, in which it may keep copies of the values of variables from the main memory that is shared between all threads. To access a shared variable, a thread usually first obtains a lock and flushes its working memory. This guarantees that shared values will thereafter be loaded from the shared main memory to the threads working memory. When a thread unlocks a lock it guarantees the values it holds in its working memory will be written back to the main memory. This chapter explains the interaction of threads with the main memory, and thus with each other, in terms of certain low-level actions. There are rules about the order in which these actions may occur. These rules impose constraints on any implementation of the Java programming language, and a programmer may rely on the rules to predict the possible behaviors of a concurrent program. The rules do, however, intentionally give the implementor certain freedoms; the intent is to permit certain standard hardware and software techniques that can greatly improve the speed and efficiency of concurrent code. A variable is any location within a program that may be stored into. This includes not only class variables and instance variables but also components of arrays. Variables are kept in a main memory that is shared by all threads. Because it is impossible for one thread to access parameters or local variables of another thread, it doesn't matter whether parameters and local variables are thought of as residing in the shared main memory or in the working memory of the thread that owns them. Every thread has a working memory in which it keeps its own working copy of variables that it must use or assign. As the thread executes a program, it operates on these working copies. The main memory contains the master copy of every variable. There are rules about when a thread is permitted or required to transfer the contents of its working copy of a variable into the master copy or vice versa. The main memory also contains locks; there is one lock associated with each object. Threads may compete to acquire a lock. For the purposes of this chapter, the verbs use, assign, load, store, lock, and unlock name actions that a thread can perform. The verbs read, write, lock, and unlock name actions that the main memory subsystem can perform. Each of these actions is atomic (indivisible). A single thread issues a stream of use, assign, lock, and unlock actions as dictated by the semantics of the program it is executing. The underlying implementation is then required additionally to perform appropriate load, store, read, and write actions so as to obey a certain set of constraints, explained below. If the implementation correctly follows these rules and the application programmer follows certain other rules of programming, then data can be reliably transferred between threads through shared variables. The rules are designed to be "tight" enough to make this possible but "loose" enough to allow hardware and software designers considerable freedom to improve speed and throughput through such mechanisms as registers, queues, and caches. A use action (by a thread) transfers the contents of the thread's working copy of a variable to the thread's execution engine. This action is performed whenever a thread executes a virtual machine instruction that uses the value of a variable. An assign action (by a thread) transfers a value from the thread's execution engine into the thread's working copy of a variable. This action is performed whenever a thread executes a virtual machine instruction that assigns to a variable. A read action (by the main memory) transmits the contents of the master copy of a variable to a thread's working memory for use by a later load action. A load action (by a thread) puts a value transmitted from main memory by a read action into the thread's working copy of a variable. A store action (by a thread) transmits the contents of the thread's working copy of a variable to main memory for use by a later write action. 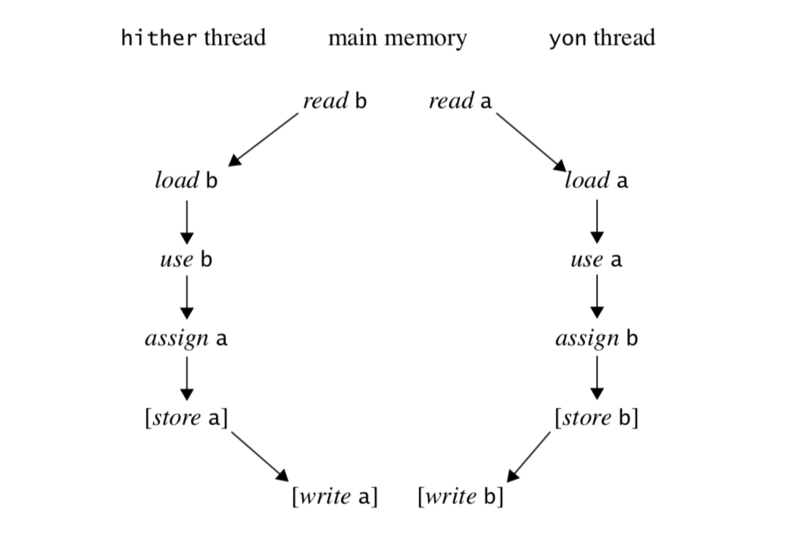 A write action (by the main memory) puts a value transmitted from the thread's working memory by a store action into the master copy of a variable in main memory. A lock action (by a thread tightly synchronized with main memory) causes a thread to acquire one claim on a particular lock. 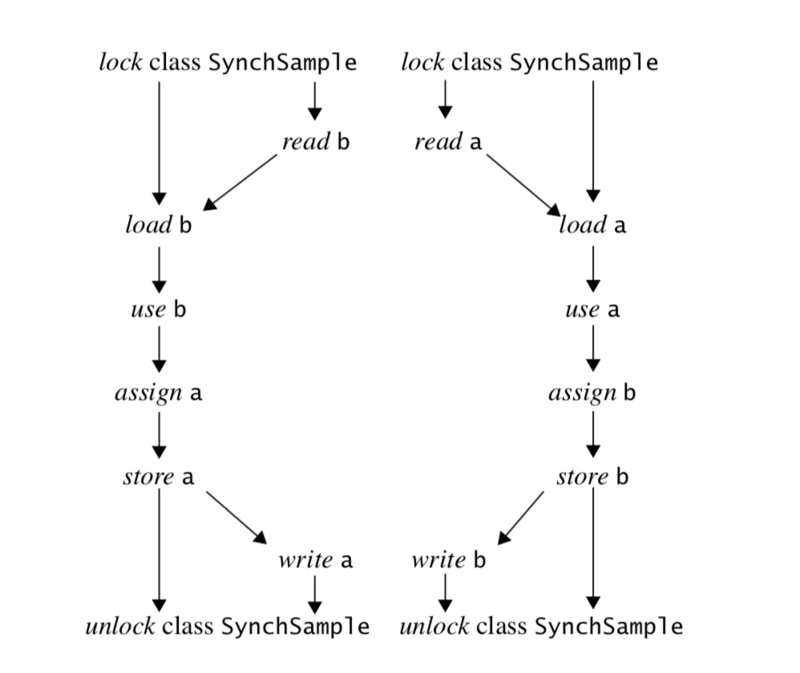 An unlock action (by a thread tightly synchronized with main memory) causes a thread to release one claim on a particular lock. Thus the interaction of a thread with a variable over time consists of a sequence of use, assign, load, and store actions. Main memory performs a read action for every load and a write action for every store. A thread's interactions with a lock over time consists of a sequence of lock and unlock actions. All the globally visible behavior of a thread thus comprises all the thread's actions on variables and locks. The actions performed by any one thread are totally ordered; that is, for any two actions performed by a thread, one action precedes the other. The actions performed by the main memory for any one variable are totally ordered; that is, for any two actions performed by the main memory on the same variable, one action precedes the other. The actions performed by the main memory for any one lock are totally ordered; that is, for any two actions performed by the main memory on the same lock, one action precedes the other. It is not permitted for an action to follow itself. The last rule may seem trivial, but it does need to be stated separately and explicitly for completeness. Without it, it would be possible to propose a set of actions by two or more threads and precedence relationships among the actions that would satisfy all the other rules but would require an action to follow itself. Each lock or unlock action is performed jointly by some thread and the main memory. Each load action by a thread is uniquely paired with a read action by the main memory such that the load action follows the read action. Each store action by a thread is uniquely paired with a write action by the main memory such that the write action follows the store action. Most of the rules in the following sections further constrain the order in which certain actions take place. A rule may state that one action must precede or follow some other action. Note that this relationship is transitive: if action A must precede action B, and B must precede C, then A must precede C. The programmer must remember that these rules are the only constraints on the ordering of actions; if no rule or combination of rules implies that action A must precede action B, then an implementation is free to perform action B before action A, or to perform action B concurrently with action A. This freedom can be the key to good performance. Conversely, an implementation is not required to take advantage of all the freedoms given it. In the rules that follow, the phrasing "B must intervene between A and C" means that action B must follow action A and precede action C.
An use or assign by T of V is permitted only when dictated by execution by T of the program according to the Java programming language's execution model. For example, an occurrence of V as an operand of the + operator requires that a single use action occur on V; an occurrence of V as the left-hand operand of the assignment operator = requires that a single assign action occur. All use and assign actions by a given thread must occur in the order specified by the program being executed by the thread. If the following rules forbid T to perform a required use as its next action, it may be necessary for T to perform a load first in order to make progress. Provided that all the constraints above and below are obeyed, a load or store action may be issued at any time by any thread on any variable, at the whim of the implementation. For every load action performed by any thread T on its working copy of a variable V, there must be a corresponding preceding read action by the main memory on the master copy of V, and the load action must put into the working copy the data transmitted by the corresponding read action. For every store action performed by any thread T on its working copy of a variable V, there must be a corresponding following write action by the main memory on the master copy of V, and the write action must put into the master copy the data transmitted by the corresponding store action. Note that this last rule applies only to actions by a thread on the same variable. However, there is a more stringent rule for volatile variables (§17.7). If a double or long variable is not declared volatile, then for the purposes of load, store, read, and write actions they are treated as if they were two variables of 32 bits each: wherever the rules require one of these actions, two such actions are performed, one for each 32-bit half. The manner in which the 64 bits of a double or long variable are encoded into two 32-bit quantities is implementation-dependent. The load, store, read, and write actions on volatile variables are atomic, even if the type of the variable is double or long. This matters only because a read or write of a double or long variable may be handled by an actual main memory as two 32-bit read or write actions that may be separated in time, with other actions coming between them. Consequently, if two threads concurrently assign distinct values to the same shared non-volatile double or long variable, a subsequent use of that variable may obtain a value that is not equal to either of the assigned values, but some implementation-dependent mixture of the two values. An implementation is free to implement load, store, read, and write actions for double and long values as atomic 64-bit actions; in fact, this is strongly encouraged. The model divides them into 32-bit halves for the sake of several currently popular microprocessors that fail to provide efficient atomic memory transactions on 64-bit quantities. It would have been simpler to define all memory transactions on single variables as atomic; this more complex definition is a pragmatic concession to current hardware practice. In the future this concession may be eliminated. Meanwhile, programmers are cautioned always to explicitly synchronize access to shared double and long variables. With respect to a lock, the lock and unlock actions performed by all the threads are performed in some total sequential order. This total order must be consistent with the total order on the actions of each thread. If a variable is not declared volatile, then the rules in the previous sections are relaxed slightly to allow store actions to occur earlier than would otherwise be permitted. The purpose of this relaxation is to allow optimizing Java compilers to perform certain kinds of code rearrangement that preserve the semantics of properly synchronized programs but might be caught in the act of performing memory actions out of order by programs that are not properly synchronized. No lock action intervenes between the relocated store and the assign. No load of V intervenes between the relocated store and the assign. No other store of V intervenes between the relocated store and the assign. The store action sends to the main memory the value that the assign action will put into the working memory of thread T.
This last property inspires us to call such an early store action prescient: it has to know ahead of time, somehow, what value will be stored by the assign that it should have followed. In practice, optimized compiled code will compute such values early (which is permitted if, for example, the computation has no side effects and throws no exceptions), store them early (before entering a loop, for example), and keep them in working registers for later use within the loop. Any association between locks and variables is purely conventional. Locking any lock conceptually flushes all variables from a thread's working memory, and unlocking any lock forces the writing out to main memory of all variables that the thread has assigned. That a lock may be associated with a particular object or a class is purely a convention. In some applications, it may be appropriate always to lock an object before accessing any of its instance variables, for example; synchronized methods are a convenient way to follow this convention. In other applications, it may suffice to use a single lock to synchronize access to a large collection of objects. 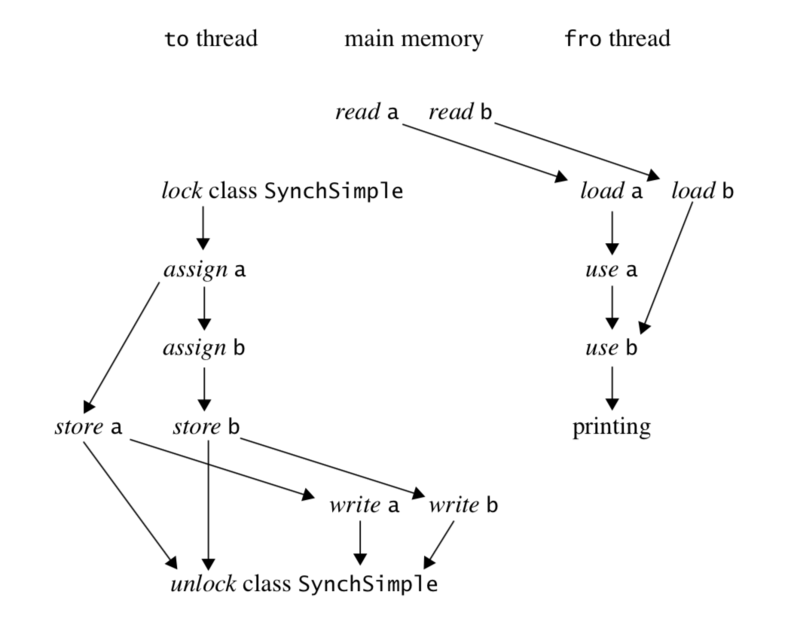 If a thread uses a particular shared variable only after locking a particular lock and before the corresponding unlocking of that same lock, then the thread will read the shared value of that variable from main memory after the lock action, if necessary, and will copy back to main memory the value most recently assigned to that variable before the unlock action. This, in conjunction with the mutual exclusion rules for locks, suffices to guarantee that values are correctly transmitted from one thread to another through shared variables. Now suppose that two threads are created, and that one thread calls hither while the other thread calls yon. What is the required set of actions and what are the ordering constraints? Let us consider the thread that calls hither. According to the rules, this thread must perform an use of b followed by an assign of a. That is the bare minimum required to execute a call to the method hither. Now, the first action on variable b by the thread cannot be use. But it may be assign or load. An assign to b cannot occur because the program text does not call for such an assign action, so a load of b is required. This load action by the thread in turn requires a preceding read action for b by the main memory. The thread may optionally store the value of a after the assign has occurred. If it does, then the store action in turn requires a following write action for a by the main memory. The situation for the thread that calls yon is similar, but with the roles of a and b exchanged. Here an arrow from action A to action B indicates that A must precede B. Thus the net result might be that, in main memory, b is copied into a, a is copied into b, or the values of a and b are swapped; moreover, the working copies of the variables might or might not agree. It would be incorrect, of course, to assume that any one of these outcomes is more likely than another. This is one place in which the behavior of a program is necessarily timing-dependent. Of course, an implementation might also choose not to perform the store and write actions, or only one of the two pairs, leading to yet other possible results. Let us again consider the thread that calls hither. According to the rules, this thread must perform a lock action (on the instance of class SynchSample on which the hither method is being called) before the body of method hither is executed. This is followed by a use of b and then an assign of a. Finally, an unlock action on that same instance of SynchSample must be performed after the body of method hither completes. That is the bare minimum required to execute a call to the method hither. As before, a load of b is required, which in turn requires a preceding read action for b by the main memory. Because the load follows the lock action, the corresponding read must also follow the lock action. Because an unlock action follows the assign of a, a store action on a is mandatory, which in turn requires a following write action for a by the main memory. The write must precede the unlock action. While the resulting state is timing-dependent, it can be seen that the two threads will necessarily agree on the values of a and b. Now suppose that two threads are created, and that one thread calls to while the other thread calls fro. What is the required set of actions and what are the ordering constraints? Let us consider the thread that calls to. According to the rules, this thread must perform an assign of a followed by an assign of b. That is the bare minimum required to execute a call to the method to. Because there is no synchronization, it is at the option of the implementation whether or not to store the assigned values back to main memory! Therefore the thread that calls fro may obtain either 1 or 3 for the value of a, and independently may obtain either 2 or 4 for the value of b. In this case the method to will be forced to store the assigned values back to main memory before the unlock action at the end of the method. The method fro must, of course, use a and b (in that order) and so must load values for a and b from main memory. As a result, the method fro could still obtain either 1 or 3 for the value of a, and independently could obtain either 2 or 4 for the value of b. In particular, fro might observe the value 1 for a and 4 for b. Thus, even though to does an assign to a and then an assign to b, the write actions to main memory may be observed by another thread to occur as if in the opposite order. In this case, the actions of method fro cannot be interleaved with the actions of method to, and so fro will print either "a=1, b=2" or "a=3, b=4". Threads are created and managed by the built-in classes Thread and ThreadGroup. Creating a Thread object creates a thread and that is the only way to create a thread. When the thread is created, it is not yet active; it begins to run when its start method is called. Every thread has a priority. When there is competition for processing resources, threads with higher priority are generally executed in preference to threads with lower priority. Such preference is not, however, a guarantee that the highest priority thread will always be running, and thread priorities cannot be used to reliably implement mutual exclusion. There is a lock associated with every object. The Java programming language does not provide a way to perform separate lock and unlock actions; instead, they are implicitly performed by high-level constructs that arrange always to pair such actions correctly. Note, however, that the Java virtual machine provides separate monitorenter and monitorexit instructions that implement the lock and unlock actions. The synchronized statement (§14.18) computes a reference to an object; it then attempts to perform a lock action on that object and does not proceed further until the lock action has successfully completed. (A lock action may be delayed because the rules about locks can prevent the main memory from participating until some other thread is ready to perform one or more unlock actions.) After the lock action has been performed, the body of the synchronized statement is executed. If execution of the body is ever completed, either normally or abruptly, an unlock action is automatically performed on that same lock. A synchronized method (§8.4.3.6) automatically performs a lock action when it is invoked; its body is not executed until the lock action has successfully completed. If the method is an instance method, it locks the lock associated with the instance for which it was invoked (that is, the object that will be known as this during execution of the body of the method). If the method is static, it locks the lock associated with the Class object that represents the class in which the method is defined. If execution of the method's body is ever completed, either normally or abruptly, an unlock action is automatically performed on that same lock. Best practice is that if a variable is ever to be assigned by one thread and used or assigned by another, then all accesses to that variable should be enclosed in synchronized methods or synchronized statements. The Java programming language does not prevent, nor require detection of, deadlock conditions. Programs where threads hold (directly or indirectly) locks on multiple objects should use conventional techniques for deadlock avoidance, creating higher-level locking primitives that don't deadlock, if necessary. Every object, in addition to having an associated lock, has an associated wait set, which is a set of threads. When an object is first created, its wait set is empty. Wait sets are used by the methods wait, notify, and notifyAll of class Object. These methods also interact with the scheduling mechanism for threads. Some other thread invokes the notify method for that object and thread T happens to be the one arbitrarily chosen as the one to notify. Some other thread invokes the notifyAll method for that object. If the call by thread T to the wait method specified a timeout interval, the specified amount of real time has elapsed. The thread T is then removed from the wait set and re-enabled for thread scheduling. It then locks the object again (which may involve competing in the usual manner with other threads); once it has gained control of the lock, it performs additional lock actions and then returns from the invocation of the wait method. Thus, on return from the wait method, the state of the object's lock is exactly as it was when the wait method was invoked.